Residents and staff from Dawson Lodge care home in West End held a garden party and BBQ on Saturday 30 June. Dawson Lodge care home in West End held the party to mark the 50th anniversary of Anchor, which runs the property. Hundreds of parties are being held across the country to celebrate the anniversary of Anchor which is England’s largest not-for-profit provider of care and housing for older. At Dawson Lodge, the party included a BBQ, cocktails as well as entertainment and the Mayor of Eastleigh, Bruce Tennant joining in the fun. 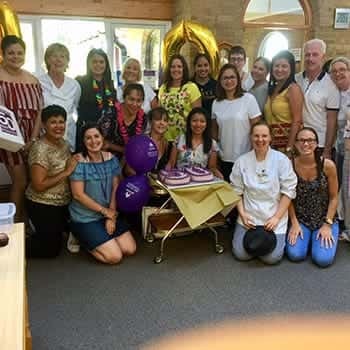 Mitchelle Perry, Manager of Orchard Gardens, said: “We hope that our residents and their families enjoyed the party on this special occasion. Since Cecil Jackson-Cole set up Anchor in Oxford in 1968, it has grown with 40,000 older people across England now living in their 1,000 retirement properties or care homes. At the anniversary parties across the country, guests will be sipping the Anchor 50th Anniversary cocktail, the recipe of which was created by residents living in one of their properties. For more information on Dawson Lodge care home, contact 0845 140 2020.